Among the tuberculosis (TB) vaccine candidates, SO2 is the prototype of the first live-attenuated vaccine that recently entered into clinical trials. To investigate the capacity of SO2 to stimulate an appropriate immune response in vitro within a human immunological context, a comparative analysis of the effects promoted by SO2, the current Bacille Calmette-Guerin (BCG) vaccine and Mycobacterium tuberculosis (Mtb) was conducted in human primary dendritic cells (DC), which are critical modulators of vaccine-induced immunity. In particular, we found that SO2 promotes the expression of maturation markers similarly to BCG but to a lower extent than Mtb. Moreover, SO2-infected DC released higher levels of interleukin (IL)-23 than BCG-infected cells, which accounts for the expansion of interferon (IFN)-γ-producing T cells in an IL-12-independent manner. In the autologous mixed leukocyte reaction setting, the expansion of IL-17-producing T cells was also observed in response to SO2 infection. Interestingly, apoptosis and autophagic flux, events required for antigen presentation within MHC class II complex, were not affected in DC infected with SO2, converse to what we observed upon Mtb stimulation. Collectively, our results indicate that SO2 represents a promising TB vaccine candidate, which displays an attenuated phenotype and promotes in DC a stronger capacity to stimulate the Th response than BCG vaccine. Interestingly, the data obtained by using the human DC-based experimental setting mirrored the results derived from studies in animal models, suggesting that this system could be used for an efficient and rapid down-selection of new TB vaccine candidates, contributing to achieving the 3Rs objective. 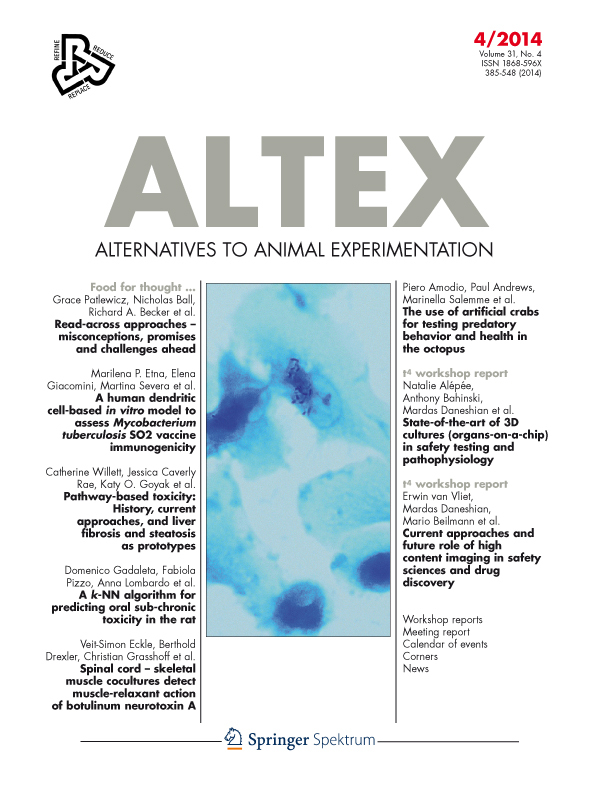 Etna, M., Giacomini, E., Severa, M., Pardini, M., Aguilo, N., Martin, C. and Coccia, E. (2014) “A human dendritic cell-based in vitro model to assess Mycobacterium tuberculosis SO2 vaccine immunogenicity”, ALTEX - Alternatives to animal experimentation, 31(4), pp. 397-406. doi: 10.14573/altex.1311041.